Allergy Advice: Contains Milk, Wheat, Egg, Soybean, Gluten. Storage Condition: Keep away from direct sunlight and store in a cool dry place. consume soon after opening. 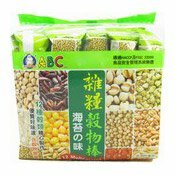 Ingredients: Palm Oil, Corn, Brown Rice (10%), Egg Yolk Powder, Sugar, Seaweed (2%), Non-Fat Milk Powder, Soy Sauce Powder (Water, Soy, Salt), Glucose, Job's Tear (Contains Gluten, Buckwheat, Wheat, Runner Bean, Mung Bean, Barley, Black Glutinous Rice) (1%), Lotus Seed, Red Bean, Black Bean. Simply enter your details below and we will send you an e-mail when “Seaweed Rice Roll (12 Multigrains) (海苔米卷)” is back in stock!